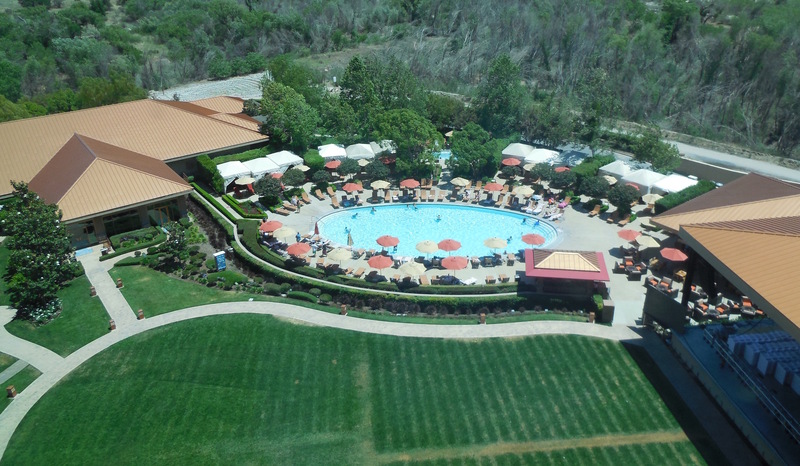 On a recent getaway, we discovered a dandy surprise, the full-service Pala Casino Spa Resort, in North County San Diego. After an efficient check-in, my wife and I headed to the Pala Privileges Center to sign up for their rewards program and the 60 Plus Club. Then we eased into vacation mode with relaxing massages at the full-service Pala Spa. There are tranquil indoor and outdoor relaxation and treatment areas, a state-of-the art fitness center and a boutique. The balance of the day was spent lounging in a cabana by the pool. That evening, we went to Choices, The Buffet. It’s the largest in southern California, featuring eight themed food stations. My favorite was the amazing array of seafood. During our stay, we enjoyed breakfasts at Cafe Amore and the Pala Cafe and lunch at the Promenade Deli; dinner at The Cave was the highlight of our gustatory adventures. The Cave has a lounge with live entertainment and a wine cellar with almost 500 labels to choose from. Chef Luciano Cibelli prepares locally sourced, modern Italian cuisine with a Mediterranean flair. The menu is inventive with small bites, bites, large bites and last bites. 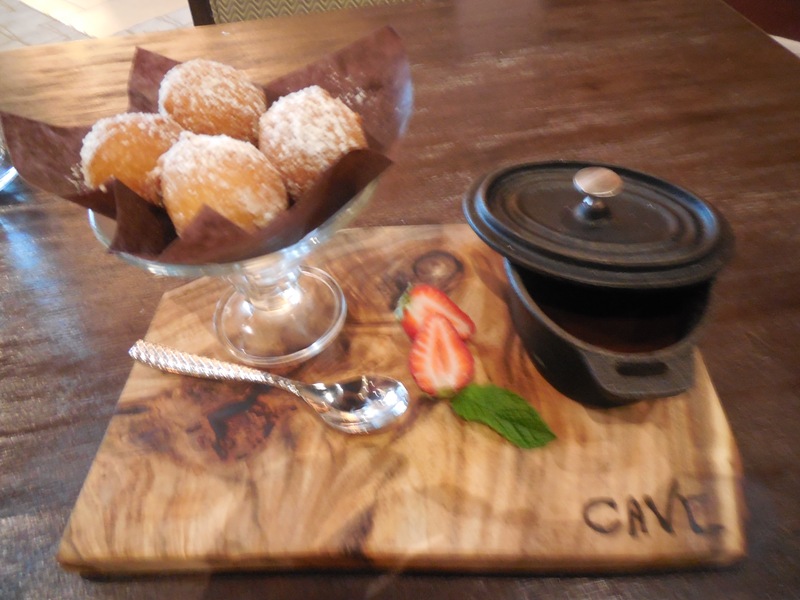 We grazed on mussels, flatbread, salad, meatballs, risotto and, of course, dessert (last bite). The latter were home-made donuts with chocolate Nutella sauce. An after dinner drink in the Cave Lounge listening to music completed a wonderful getaway day. In the morning, during a walkabout to further scope out the resort, we discovered a meditation maze and a well-marked 1.5 mile walking trail. It was hard to believe how quickly we entered backcountry terrain so close to a luxury resort. Our attention then turned to the main attraction, the casino. It features slots, table games, bingo and, of course, my favorite, poker. Fortunately, I was there on a Sunday when a daytime hold ‘em tournament was scheduled (the others are Thursday – Saturday nights). The game turned out to be a World Poker Tour satellite with some serious competition. The poker room is well run and clearly has a local following. 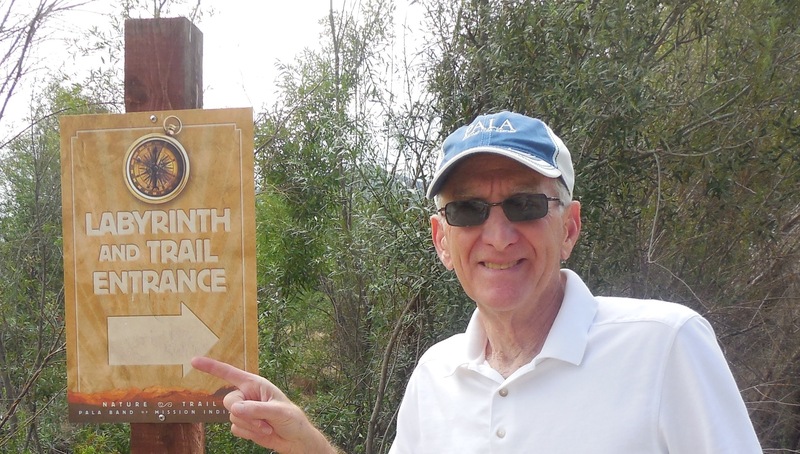 It’s easy to understand how Pala earned its coveted Four Diamond rating. And, at trip’s end, there’s nothing better than a short drive home. Nice touches abound; no resort fees, free Wi-Fi, newspapers, bottled water in the room and complimentary soft drinks in the casino. The comfortable, nicely decorated rooms have plenty of outlets for your devices. 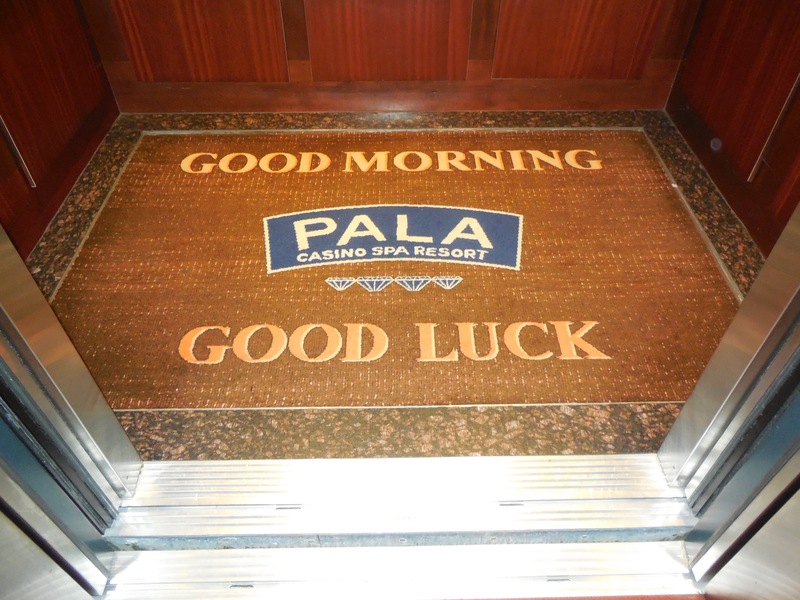 Pala Privileges provides special promotions and discounts. There are 11 restaurants to choose from, including table-side dining in the Poker Room from either Noodles or the Promenade Deli. 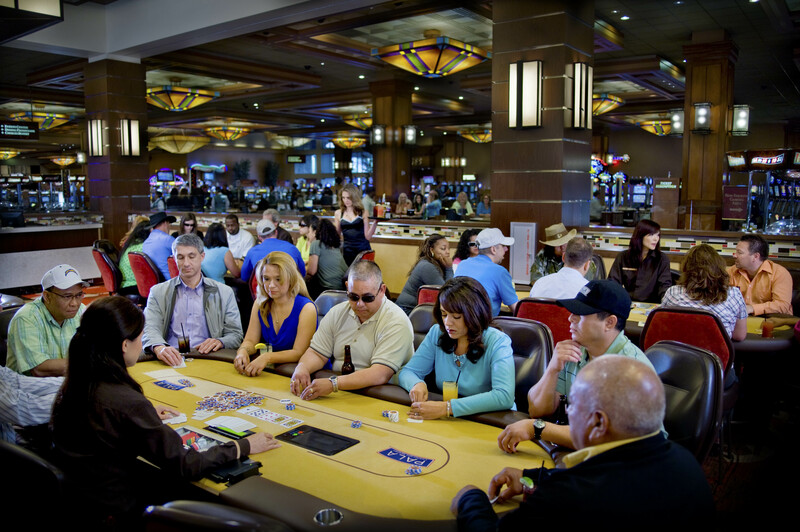 A High Limit Area for gaming is located in the casino. Tuesdays rule for the 60+ Club. In the Infinity showroom, there’s free entertainment plus a 30% discount at Choices, The Buffet. Call 1-877-946-7252 or logon to www.palacasino.com for information or reservations and sign up for their email updates. 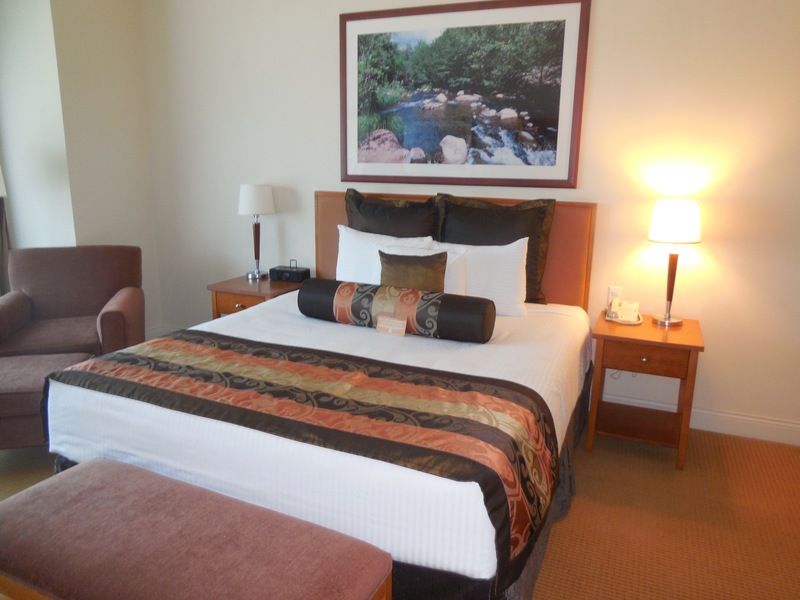 Did I mention, really nice, comfortable rooms? Planet Pala is the green program begun at the resort in 2008, including a recycling center for the public as well as for the resort. Over 300 tons of waste is recycled annually. Their motto is “Think globally, but act locally.” For the history and odyssey of the Pala Band of Mission Indians, go to www.palatribe.com/about/the-history.com. Thanks to various websites for photos and information and to Susan Rosensweig for editing and proofreading. This entry was posted in California, Poker and tagged backyard getaway, california, full service resort, poker, san diego, travel. Bookmark the permalink. ← Pack Right, Pack Light….